Dr. Catherine Payne was featured in one of Oldham's blogs on the 'GM 1914 : The First World War in Greater Manchester' website and also on our own website. Some months later we were contacted by a grandchild of Catherine's half brother. Catherine's father had died and her mother, Amelia, had married again, this time to Henry Wostear, and had a further 2 children, one of whom was the grandfather of our correspondent. With her kind help we were able to fill in some of the details of her life. The photos of family and the certificates, on this page, are courtesy of the Trask family, except where attributed otherwise. To go back to the beginning ... Dr. Catherine Payne was a remarkable woman in more ways than one. At the turn of the century, in 1902, she decided to study medicine and become a doctor. In 1915, she answered the call for aid workers in the Typhus epidemic in Serbia, and joined Mrs. St. Clair Stobart's Field Hospital. At this time women who pursued a career or carried on into further and university education did so in the face of great opposition. These were the days when no woman could vote in General Elections; equal opportunities or pay in the workplace were unheard of and dismissed as ridiculous if even mentioned. 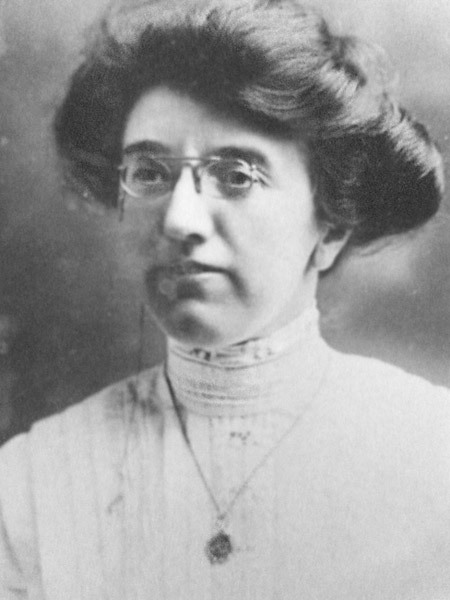 The Women's Suffrage movement was alive but with a changing ethos as it became more attractive to the working women who saw that women's suffrage could expedite changes for women in the workplace; and Mrs. Pankhurst was yet to found the Women's Social and Political Union (W.S.P.U.) in 1903, with the Motto, 'Deeds not Words'. Through their militant actions they would become 'tagged' as 'suffragettes' in a newspaper in 1906. 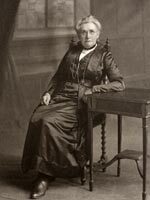 In Oldham there was an active Women's Suffrage Society, the President of which was Marjory Lees whom Catherine would have known through her post as Medical Officer with the Poor Law Institution. 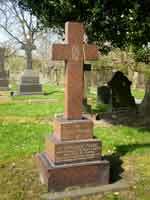 Catherine was also one of the Vice-President's of the Oldham Women's Suffrage Society during 1916 and 1917 (ref. the AGM reports for the Society). Catherine was born on the 14th December 1876, in Monks Eleigh, Suffolk, near Lavenham. Her mother was Amelia Payne, nee Hodges, and her father was Charles Payne, by occupation a draper. She had an older brother, Roger, born January 27th, 1874 and a younger sister Alice, born at the end of 1880. On the 1881 census the family were living on High Street in Monks Eleigh. By the time of the 1891 census both baby Alice and Charles Payne had died, and the widowed Amelia had married Henry Wostear in the first quarter of 1891. Henry's occupation was recorded as a Machine Engineer and the family was living in Luton Road, Chatham. Seventeen year old Roger was a 'Chemist's Apprentice', living in Saffron Walden. Back to Catherine, again ... was it whilst she and Roger were living together in London, that Catherine first found an interest in medicine? We can't know for sure but in September 1902, when she was 25 years old, she filled in an application form for admission to the London (Royal Free Hospital) School of Medicine for Women. It's possible that she may have already completed a course of study at the Royal Holloway College as her application form shows a recommendation, for admission, from a person at the college. She completed her training in 1907 and came to Oldham in 1910. By the time we come round to the 1911 census, Catherine is recorded as the Head Surgeon at Oldham Infirmary on Union Street. Soon afterwards she would take up a post with the Oldham Poor Law Union where she would stay until she resigned in 1915 in order to go to Serbia. The Minutes of the Meeting of the Board of the Union, for 17th March 1915, record that 'It was moved by Miss Lees, seconded by Mr. Philip Buckley and resolved: That the board having received and accepted the resignation of Miss Catherine Payne M.B.B.S. of the appointment of Resident Assistant Medical Officer at the Oldham Poor Law Institution do place on record their esteem, regard and high appreciation of the valuable services rendered by her to the Sick Indoor Poor during the period she has held the position and do express their sincere hope that in Serbia whither she is about to proceed she may be given the health to continue the practice of her profession with that skill which has hitherto characterised her efforts." Just over two weeks later she was on board ship with Mrs. Stobart and en route to Serbia. We know from a diary kept by Monica Stanley, a V.A.D. with the unit, that it was not the most enjoyable trip, "..."it was a horrid boat, not at all clean and the sanitary arrangements were terrible." and, to make matters worse, the weather became stormy ... and they were all given tickets for the lifeboats, in case of attack from submarines! We know a great deal about this particular unit's activities as Mrs. Stobart wrote a book about it, called 'The Flaming Sword' which was published in 1916. Briefly ... when they reached Salonica they discovered that their final destination was to be Kragujevatz, about 60 miles from Belgrade. Less than three weeks after they had left Liverpool, they had reached Kragujevatz, found a suitable site for their tented hospital, pitched the tents and installed the equipment. The staff were virtually all women + a number of Austrian P.O.Ws. to do the heavy work. Within days it was realised that they were not only needed to treat sick and wounded soldiers but that there was also a desperate need for a Dispensary for the civilian population. Mrs Stobart wrote, "...we immediately pitched a bell tent at the outer edge of the hospital encampment on the roadside, improvised a notice board from an old packing case and, with the help of an interpreter, wrote, in Serbian, words to the effect, that if folks would bring their own bottles, medicine and medical advice would be given gratis. A doctor, a nurse, and an interpreter took charge of the tent dispensary and we waited with eager curiosity to see what happened. The result was that within a few weeks 12,000 people, men, women, and children, came to this roadside dispensary either in ox-wagons or walking, from distances of fifty, sixty, even seventy miles, ill with typhus, diphtheria, typhoid, smallpox, tuberculosis and every conceivable and inconceivable form of disease." So successful was this initiative that it was decided to establish a ring of the dispensaries within a 30 mile radius of the hospital. The necessary funds were again raised by the Serbian Relief Fund and extra staff and equipment were sent out. A total of 6 dispensaries were set up. However, their subsequent existence was to be short-lived. In September Bulgarian troops were massing to the east and Austrian and German forces to the north, preparatory to invading Serbia. As the Serbian Army mobilised, Mrs. Stobart was asked to organise a Flying Field Ambulance(Hospital) to accompany the army to the front. Catherine was one of the two doctors selected, along with a group of nurses, a cook, a couple of orderlies, a dispenser, 6 drivers, interpreters and sixty Serbian soldiers who would be used as ambulance men and drivers ... the remainder of the hospital staff and doctors would remain at Kragujevatz but the Dispensaries would have to close. Their equipment, tents and stores were packed into 30 wagons and these, in turn, were loaded onto railway wagons and all left for Pirot, and the front. train heading for the Front. Early October, and they hardly had time to erect the hospital tents before wounded Serbian soldiers started to arrive and news came that enemy forces were advancing and the Serbian Army, with the Field Hospital, was forced to retreat. The next 3 months would see not only the army retreating but also the refugee civilian population, as they abandoned their homes in the path of the oncoming enemy. They were constantly on the move, along roads that were barely passable; over high mountain passes and past the dead, both human and animal, on all sides; winter set in; food, both for themselves and the horses, donkeys and oxen, was almost impossible to find. In spite of all the difficulties and hardships, the hospital unit still managed to look after the sick and wounded, that came to them for help, throughout those three terrbile months. Even when they reached the coast there were problems in finding a boat to take them but, eventually, they found one to take them to Scutari, then it was on to Brindisi and then by train through Italy to Paris and finally London. Additional information, photos and family papers kindly contributed by the Trask family.